The 100 Baht banknotes have 2 types as follows. 100 Baht type 2 change the color of back side to dark blue. Plain note without serial number nor signature UNC about 48,400 - 50,800 baht. Type 1 ordinary number signature Pao UNC about 99,000 - 105,000 baht. Type 1 ordinary number signature Leng F about 18,900 - 19,800 baht. Type 2 ordinary number signature Leng UNC about 22,500 - 23,500 baht. Type 2 ordinary number signature Leng VF about 16,000 - 16,800 baht. Type 2 ordinary number withoue signature UNC about 15,400 - 16,100 baht. 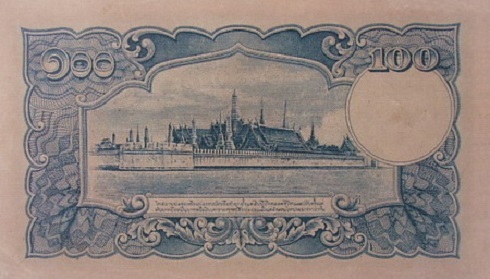 The banknotes from Japan were transported to Thailand by air and by sea. The Mitsui Bussan Kaisha Company reported that a plane had technical problems and had to land at Hunan Island. One box of 100 Baht (type 2 S 13 and S 14) notes was broken and 11,518 notes were burned. But later the reported burned notes were found in circulation. The Ministry of Finance announced on 14th Febuary 1946 to indicate those illegal notes. And the Bank of Thailand compromised to accept notes from one who had evidence showed that they had been received before announced date. 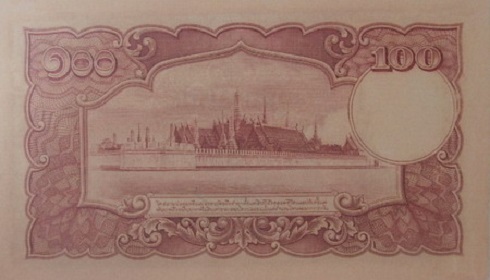 The 5th series 100 Baht type 1 banknotes were announced on 20th October 1943. 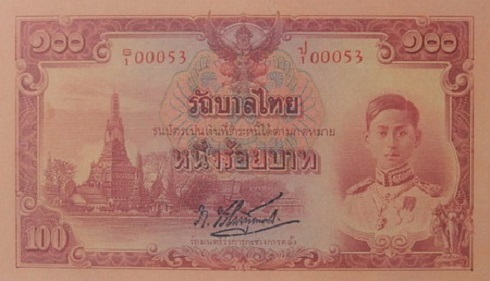 The 5th series 100 Baht type 2 banknotes were announced on 5th March 1945. The main object is the image of King Rama 8 on the right. The left is the image of the Temple of Dawn. The middle is the "Thai Government" on guilloche design. The serial code and number were printed with red ink. The watermark image is the constitution on pedestal tray.